Having acquired a trademark for “Bitcoin” in April this year, UK firm A.B.C. IPHoldings South West LLC started to threaten a small seller of bitcoin-themed t-shirts on Etsy with a lawsuit. As CCN reported on May 25, the business owner published the claim letter on his Reddit profile. “I didn’t believe it at first since I knew that bitcoin and the bitcoin logo are public domain, and even a similar trademark application in the US failed,” the user wrote. 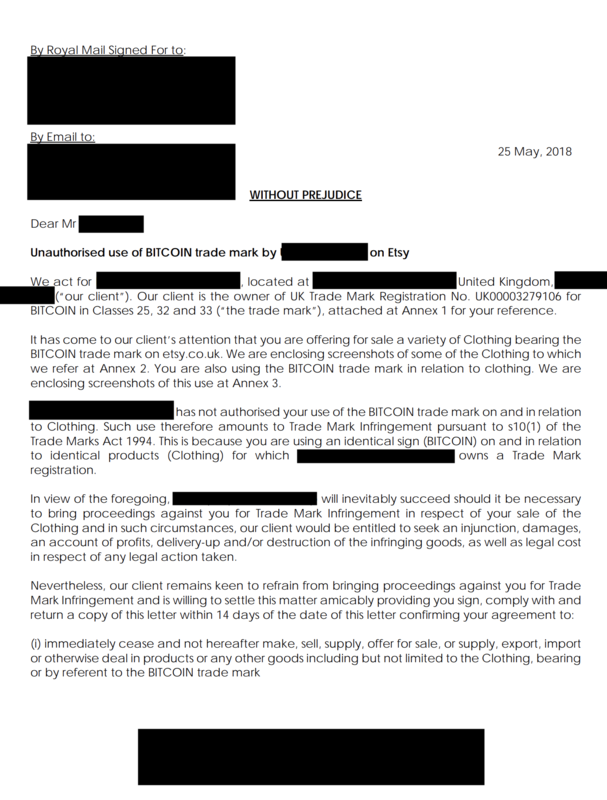 The owner of a store with bitcoin merchandise posted on the Reddit a letter he had received from a company claiming to have a trademark for “Bitcoin”. The range of the goods under "Bitcoin" trademark includes footwear, clothing, non-alcoholic and alcoholic beverages. The letter also contained a request asking to get rid of all the stuff that depicts a famous cryptocurrency. Furthermore, it was stated that Etsy store had to recall all fintech-related goods to the trademark possessor, otherwise, it would get sued. Nevertheless, a deeper insight into the issue showed that A.B.C. IPHoldings South West LLC does own this trademark. The respective application had been submitted to the UK Intellectual Property Office in December 2017 and was approved last month. This case seems to be the first successful one in the history of cryptocurrency market, as some companies have already tried to trademark the name of a world’s most popular financial technology. In March 2015, Urban Trend’s made an attempt to trademark bitcoin technology but got a rejection from the United States Patent and Trademark Office. Russian financial market regulator Rospatent also did not accept the request of the Moscow-based firm M-Group desiring to obtain the copyright authority for Bitcoin.